You can cultivate a transformational leadership style no matter your role, position, or experience. Transformational leadership characteristics can contribute to inspiring your teams, encouraging initiative and innovation, and improving care. TRANSFORMATIONAL leaders inspire followers to achieve extraordinary outcomes and, in the process, develop their own leadership capacity. They foster employees’ confidence to produce creative outcomes and sustain a competitive edge in an ever-changing healthcare environment. The American Nurses Association’s (ANA’s) Nursing Administration: Scope and Standards of Nursing Practice list the characteristics of transformational leaders as open communication, inspiration, enthusiasm, supporting positive change, and empowering others through shared decision-making. 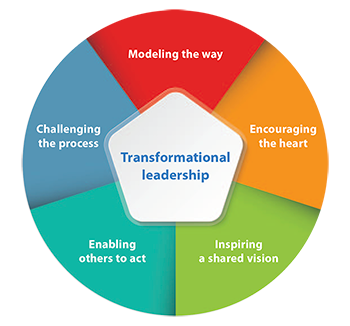 Closely aligned with transformational leadership is exemplary leadership, which is described by Kouzes and Posner as including these five practices: modeling the way, encouraging the heart, inspiring a shared vision, enabling others to act, and challenging the process. Transformational leadership, a core component of the American Nurses Credentialing Center (ANCC) Magnet Recognition Program®, supports practices and behaviors that improve nursing and organizational outcomes, such as job satisfaction, organizational commitment, productivity, and turnover. As a nurse leader, you can be intentional in cultivating your personal leadership style, leading by example and creating a positive and empowering esprit de corps that supports nursing excellence. This article will help you become intentional in cultivating your transformational leadership skills and practices. And we recommend using Kouzes and Posner’s theoretical framework and assessment tool to support your professional development. The exemplary leadership model offers a clear path for anyone wishing to cultivate a transformational leadership style. The following summaries of the five exemplary leadership practices incorporate select criteria from the transformational leadership component of the 2019 Magnet® Application Manual. You model the way by setting the example for others to follow, demonstrating open communication and enthusiasm for nursing excellence and patient care. Experienced nurse leaders interviewed about this practice provide visibility on the units with daily rounding,timely multidisciplinary huddles for significant events, and consistent follow-up with staff about concerns so that they know their leaders care. In addition, these leaders are transparent with staff in positive and difficult situations, resulting intrust, respect, and collaboration. Leading by example: When a nurse leader wanted his staff to “commit to sit” with patients for a few minutes to increase engagement, he purposely sat with patients when he rounded and modeled behaviors that he wanted his staff to learn and adopt. You encourage the heart by enabling input into key decisions from all levels of the organization, appreciating individual contributions, and celebrating accomplishments. You can use this practice to improve patient care and the practice environment by consistently rewarding staff (use a mix of strategies when recognizing individual accomplishments; some may not want to be publicly acknowledged), making eye contact, establishing personal connections through shared interests, sharing family pictures, and connecting with staff during good and bad times. Leading by example: When one of her nurses achieved national certification, a nurse leader recognized this accomplishment by sending a congratulatory global email to her direct reports and posting the individual’s picture within the department. This motivated others to achieve similar accomplishments and has contributed to 12 other nurses achieving national certification within a 3-year period. You inspire a shared vision for the future when you can effectively envision it yourself and describe it to others in a way that elicits excitement. Your passion for making a difference is evident, and you enlist others in seeing exciting possibilities for the future so that everyone is aligned in purpose and action. Leading by example: One nurse leader exemplified this behavior when three of her clinical units were consolidated into one service line. She solicited staff input on what this new structure should entail, generated excitement about the new competencies they would gain by caring for patients both on and off of the intensive care unit, and explained how the patients and organization would benefit overall. In 1 month, 100 RNs eagerly cross-trained for all three clinical units. You enable others to act when you enlist them to participate in new opportunities and engage them in collaborative activities, creating a sense of trust and empowerment. You’re dedicated to the concept of structural empowerment and professional governance, and you emphasize professional obligation, accountability, interprofessional collaboration, and shared decision-making. Examples of this leadership practice include advocating for resources to support unit and organizational goals, leadership development, mentoring, and succession planning. The unit culture should be open and supportive to employee input on new initiative implementation. Leading by example: When one nurse leader allowed her staff to schedule themselves, she noticed that sick calls decreased dramatically. Self-scheduling enabled her staff to assume accountability and responsibility for their unit staffing. When you challenge the process, you’re not always satisfied with the status quo. You take risks and experiment with new ideas, and you learn from mistakes in away that identifies new opportunities and supports positive change. You identify your ability to influence organizational policy, using data to make decisions and lead strategic organizational changes. Leading by example: When two clinical units were experiencing communication challenges, a nurse leader helped improve the relationship between the two clinical specialties when she encouraged nurses from one specialty to conduct mobile rounds in the other. Being physically present and engaging in conversations with their colleagues provided key insights into each specialty’s roles, which led to mutual feedback and cooperation. After two nurses became engaged in earnest transparency to engage and improve communication, their efforts became contagious, motivating everyone to foster more collaborative relationships. No matter your role, position, or experience, you can cultivate a transformational leadership style. The LPI-S provides insights you can use today to intentionally develop these leadership characteristics. Taking this step will start you on your journey to inspiring your teams, encouraging initiative and innovation, and improving care. Joanne T. Clavelle is regional vice president/CNO at West GetWellNetwork in Bethesda, Maryland. MariLou Prado-Inzerillo is vice president of nursing operations at New York–Presbyterian in New York City. American Nurses Association. Nursing: Scope and Standards of Practice. Silver Spring: Maryland; 2010. Bass BM, Riggio RE. Transformational Leadership. 2nd ed. 2005; London: Psychology Press. Clavelle JT, Drenkard K, Tullai-McGuinness S, Fitzpatrick JJ. Transformational leadership practices of chief nursing officers in Magnet® organizations. J Nurs Adm. 2012;42(4):195-201. Clavelle JT, Porter O’Grady T, Weston MJ, Verran JA. Evolution of structural empowerment: Moving from shared to professional governance. J Nurs Adm. 2016;46(6):308-12. Kouzes JM, Posner BZ. 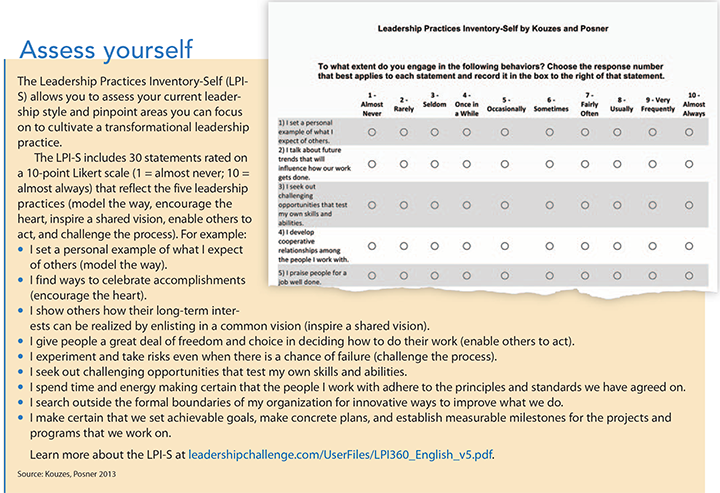 LPI: Leadership Practices Inventory: Development Planner. 4th ed. 2013; San Diego, CA: Pfeiffer. Kramer M, Schmalenberg C, Maguire P. Nine structures and leadership practices essential for a magnetic (healthy) work environment. Nurs Adm Q. 2010;34(1):4-17. Mittal S, Dhar RL. Transformational leadership and employee creativity: Mediating role of creative self-efficacy and moderating role ofknowledge sharing. Management Decision. 2015;53(5):894-910.